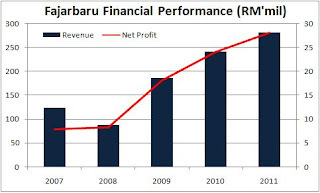 Fajarbaru is one construction stock that hasn't moved much for the past 3 months, hovering between RM1.15 to RM1.30. I believe investors are probably waiting for more concrete news to come for this stock such as project awards from the new LCCT terminal worth RM2bil, upgrading of Penang Airport worth RM250mil or subcontracting works from large scale projects. Its current orderbook is still alright at RM450mil considering its revenue back in 2007, 2008 and 2009 were RM123mil, RM88mil and RM185mil respectively. By simple calculation, revenue has to reach RM225mil per year to finish its current orderbook, which is still a decent 22% y-o-y increase for FY06/2010 (Financial year ending June), assuming no replenishment of orderbook. Potential beneficiary of small & large scale Government projects: Fajarbaru is a strong contender for large scale projects such as the new LCCT terminal worth RM2bil and upgrading of Penang Airport worth RM250mil, owing to its vast experience in airport works such as the Phase 1 of LCCT extension, subcontract works for KLIA, Penang Airport taxiway & apron rehab., current ongoing Phase 2 of LCCT extension and MRO hangar at KLIA which added up to a total of RM356mil worth of airport works. In addition, the Company might secure some subcontracting works from large scale projects such as the Double Tracking for Gemas-JB line worth about RM7.5bil (though the timeline for this project remains uncertain) given its current experience in subcontracting works for Gemas-Seremban Double Tracking project awarded by Ircon. Government's stimulus packages which include smaller projects might benefit Fajarbaru as well given its portfolio which includes small-scale projects. Favorable margins: Margins will remain strong owing to the Company's ability to design & build, which allows them to manage their costs and time more efficiently while at the same time, these design-and-build projects command higher margins. Historically, margins have been impressive at close to 10% for the past 2 years and recorded net margins of 11% and 15% for the past two quarters, a rather impressive feat for a construction company. Furthermore, with raw material prices becoming stable and more predictable as compared to 2007-08, managing of construction costs becomes easier. Strong management: The company is helmed by MD & CEO of Fajarbaru, Dato Low Keng Kok who was the former joint MD of Road Builder Holdings Bhd (a reputable construction company). Backed by 3 decades of experience in management of building, infrastructure and privatisation projects in addition to being a substantial shareholder with 7.9% stake currently (from 6.4% earlier this year), Low could steer the company to greater heights. (Maybe he wants to create another Road Builder..hehe). Valuation: The recent private placement of 10% of its shares issued added another RM16mil to its cash pile from RM89mil to RM105mil, translating into 64.6 sen per share which is half of its share price already. The huge cash pile used to gear up for upcoming Government projects probably shows the Company's optimism in obtaining the awards. By imputing RM200mil replenishment of orderbook per year, its net profit has the potential to reach RM30mil by FY06/2011, which is 18.5 sen. Assuming EPS of 15-18 sen for FY2010-11, PER is only at 6.6x-8.2x. By attaching PER of 10x, the share price should rise to RM1.50 from current price of RM1.21. In the meantime, wait for project awards for Fajarbaru such as LCCT, double tracking projects, Penang Airport etc which will trigger a run-up in share price. Or else, share price might just continue to remain unexciting. Malaysia Airports Holdings Bhd (MAHB) (5014), the country's biggest airport operator, hopes to start earthworks next month on the new permanent low-cost carrier terminal (LCCT) in Sepang, its chairman Tan Sri Dr Aris Othman said. Aris said it was crucial that works begin next month for MAHB to complete the LCCT by the third quarter of 2011. "We are sticking to our 2011 deadline," he told reporters after the graduation ceremony for 194 airport security staff at the Bunga Raya Complex in Sepang yesterday. In March, MAHB said it would complete the new terminal and a new runway within two and a half years, without exceeding the estimated cost of RM2 billion. The permanent LCCT will be located to the west of the main KLIA terminal building, roughly 1.5km in distance. The new terminal building will be 150,000 sq m and hold up to 30 million passengers a year, with capacity for expansion of up to 45 million passengers. MAHB is also planning substantial investments to beef up its retail shopping and services division to boost revenue. In the financial year ended December 31 2008, its retail and food and beverage division posted RM304.9 million sales, or about a fifth of the group's revenue of RM1.51 billion. Aris said MAHB will focus on renovations to the main terminal building of the airport to enhance the retail facilities located there. "We realise we cannot rely on airport charges alone as these tend to remain stagnant or low due to the competitiveness of many airports around the world." Fajar has recently advertised for some senior management staff, particularly a senior contract manager. Does this mean that the co. is getting some big contracts which is too big for them to handle and requires to contract out?